Dear Evan Hansen on Broadway tickets are easily purchasable online. I recommend purchasing your theatre tickets before you go to New York to save time and money. Dear Evan Hansen is playing in the Music Box Theatre. The story focuses on Evan, a high school student who feels invisible. As a sort of therapy, he begins writing letters to himself. One of these letters accidentally falls into the hands of Connor, another school outsider. When Connor commits suicide, his family conclude that, against expectations, he had had one good friend, Evan. Evan, therefore, finds himself having to make an important decision: does he let everyone continue to believe that he and Connor were good friends, or should he disappoint Connor’s family and put himself in an awkward position by telling the truth? 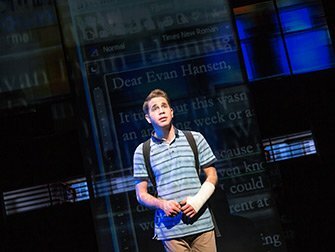 How to buy Dear Evan Hansen on Broadway tickets? It’s easy to buy tickets for Dear Evan Hansen. Above you can select the date when you want to go. You’ll get an overview of all the tickets available. You can then choose how many tickets you would like, add them to your cart and pay right away. After paying, you’ll receive a confirmation and your voucher by email right away. You’ll exchange the voucher for tickets at the theatre on the day of the show, at least one hour before the show starts. Seats are assigned by the theatre, therefore, you won’t know your exact seating at the time of booking. Seat numbers will be clearly marked on the tickets. For bookings up to 4 people you are guaranteed seating next to each other. For larger groups the theatre will try its best. 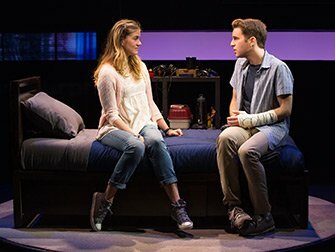 How to buy Dear Evan Hansen tickets? It is easy to buy tickets for Dear Evan Hansen with the link below. I recommend buying tickets online before your trip to New York. Why? A lot of shows are very popular and are often sold out. You’ll also save time and money and most importantly you don’t have to stress about finding tickets when you are in New York. Eric’s Tip: Dear Evan Hansen is a moving and relatable musical. Either going through the drama of high school, being bullied – or getting caught up in a seemingly innocent lie – we’ve all been there. Because it’s an unconventional topic for a musical it’s very popular. If tickets aren’t available above and you really want to go, check here. Recommended for ages 12 and up. Children up to 4 years aren’t permitted in the theatre. Don’t want to see Dear Evan Hansen?